Some cool looking fruit sets. Ive got a bunch of types to test and narrow down the best ones to plant out on some large supports. Anyone have input on what thry think is a good commercial variety? So far Im liking american beauty, condor, dark star, S8. Still have more side by side testing to do before deciding which types to do larger plantings of. Tried this Bruni yesterday. Its quite sweet (brix 20). Very similar to megalanthus fruits taste and sweetness. It was picked a little early (wanted to try it before animals got it) and late in the year. These could easily be mid 20s on the brix scale next year. Its lacking in the flavor department but if its sugar you want, these deliver. I picked that Bruni fruit a while back, the one I posted a picture of. 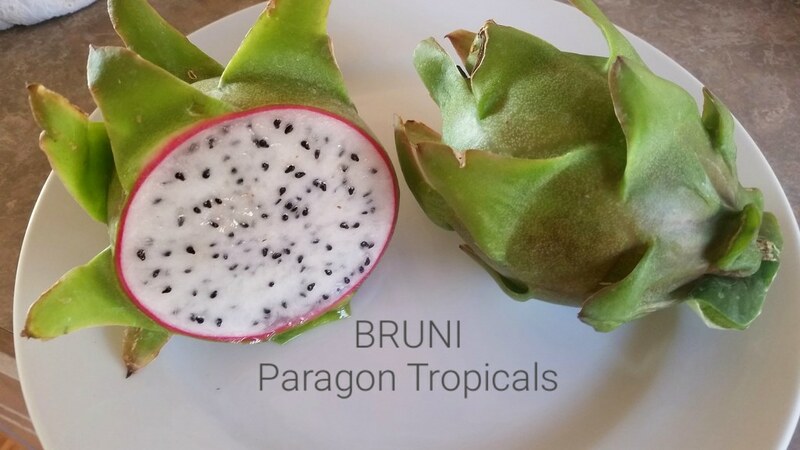 It was okay, tasted like a typical white-fleshed dragonfruit. I only ate a little bit, since I wanted the seeds, but they haven't sprouted, after about a week. It's possible I did something wrong in drying them, but I kinda doubt that. They may be infertile, since they were intergeneric hybrids. Brad, sounds like a variety that kids would enjoy. Is the peel supposed to be green when ripe? They have purple flowers right? Peel is green when ripe but could get more red blush if left longer. I only had 2 fruits and they were on a potted plant and fruit was on the ground. Mice got half of one so I took them both off. They needed another week or 2. I'm pleased to show some good fruits from my DF picked today. I planted 10 posts with four cuttings each a year ago, they grew well and flowered well early in the summer but all flowers yellowed and fell. Later in the summer there was a second flowering which I hand pollinated and got a few fruits but many flowers became infested with fruit fly larvae and fell. The last flowering was sparse and I just ignored them and they came through with two very nice fruits. Perhaps the plants just needed more time and things worked out. This is an unnamed variety which was planted on a tree when I bought the property and propagated. There were several varieties most white fleshed this was my favorite. I'll try to get a brix when I find my refractometer but it was average sweet to me. Hi, I just joined the forum last week. I have been growing dragon fruit for a year now and it looks like this is where in the future I will post some cuttings of my plants when I prune them. I have a lot of reading to do and I am very excited to learn all I can about dragon fruit. This is my dragon fruits winter home. You really should get ahold of some Sugar Dragon variety. I personally havnt tried the new, larger yellow fruits that have started showing up recently, but I know I wasn't a fan of the original yellow Megalanthus. It wasn't its sugar content either that turned me off, in fact, it was almost the opposite. To me, Megalanthus yellow tastes almost entirely of sugar, like eating old time rock candy, pure sweet but no other flavor. I do know some of the darker reds and magentas are getting pushed into high sugar production, but for me its not all about sweet. Add a bit of fruity flavor to that, though , and now we're talking. Having said that, Im hoping I can get a chance to check out that new yellow variety sometime soon to I can give an honest, personal, comparison. Its just sugar flavor again. I had some sugar bomb american beauties here that were as sweet as the yellows plus a nice grape floral rose flavor. Excellent. I prefer that any day over the giant yellow. The fruits are larger and easier to grow too. I've had the yellow Megalanthus fruits from different countries and I notised a slite difference in appearance and taste. One was sugar sweet with no other flavor and the other one had a sweet lemonade like flavor which I liked more. Had anyone else tasted one with the lemonade flavor? At least some Palora sold here in Spain have that lemon like taste for what I've heard. There is an acid/sugar ratio that is different. I have not heard the "lemonade flavor" used much. I've done some heavy pruning in advance of next year. Each post had four leaders last year which when tipped produced about 10 branches. This tipping of 10 or so branches I hope will result in 20 or more branches. Hey, I am looking for 3 sugar dragon cuttings. Does anyone here have any to sell. What kind environment are the plants in? Indoors, outdoors, grow lights etc? Hello guys, I have aged sheep manure (8months old) with redworms and grasses growing above, I want to put it on my dragons soon, they are now potted but I'm going to plant them in field until next month. My cutting are 1 and 2 years old, how much the quantity per plant should be? Furthermore, how much epsom salt you use to spray plants?